We are specialised in radiant heaters, infrared heaters, electric heaters, water supplied heaters and ceiling heating systems. Radiant and infrared heaters work by heating solid surfaces instead of the air, which gives a gentle and natural heating with a high level of comfort and with energy savings of 25-50%. We offer the following quality products: EnergoStrip, EnergoInfra, EnergoInfra Industry, Energocassette and EnergoLine. Lean against a wall on a cold morning once the sun is up and you’lI feel surprising warmth even though the temperature may still be several degrees below zero. That’s because the sun’s rays warm the atmosphere by heating solid objects. EnergoStrip works on the same principle. This provides a natural, all over, comfortable heat without cold spots or draughts, with energy savings of 25-50% in comparison to conventional heating, i.e. hot air. 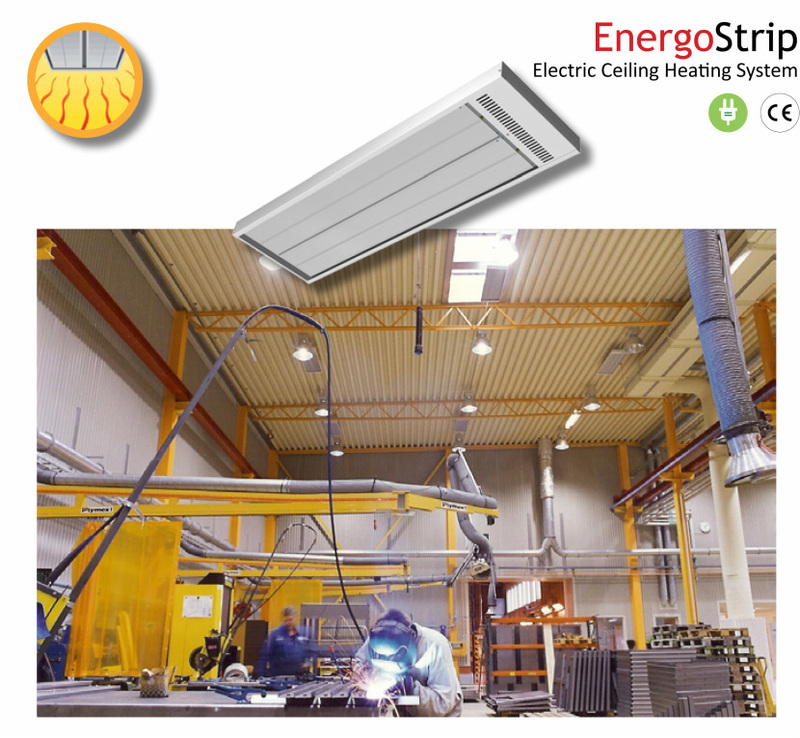 EnergoStrip can be mounted from 2 to 40 m ceiling height and is suitable for a wide range of applications such as daycare centres, houses, schools, churches, conservatories, showrooms, warehouses, factories, tennis and sport stadi-ums etc. EnergoStrip is approved in splash proof IP44 design for wet and dry areas. EnergoStrip is made of white powder coated galvanised sheet steel (except EE36 - uncoated) in three basic models. With one heating element: EE6 and EE10. Two heating elements: EE8, EE12, EE16 and EE20. Three heating elements: EE24, EE30 and EE36. The heater should be fitted to the ceiling, see distance in table, using the standard ceiling brackets supplied. It can also be suspended on wires, chains etc. However for the EE24 and EE36 we recommend using the ceiling brackets. EnergoStrip has an unique construction which avoids the creation of electro magnetic fields (emission tested by SEMKO). EnergoStrip is approved for fixed installation by an authorised electrician. Cable connections are to a 16 mm² terminal (EE6 and EE10 to a 6 mm² teminal) in the junction box at the end of the heater. The junction box has two cable lead-ins. Connection between several heaters is possible. Note! EE24 and EE36 are convertible between 230V and 400V. Heat control is simply carried out with use of our room thermostats. Where a large number of heaters are fitted, one of our control panels may be used (ask us for a separate brochure). and utility rooms. Ceiling or wall mounted. Energolnfra is used often as a supplementary heater in conservatories, balconies, patios etc. It is also suitable for spot and zone heating in workshops and warehouses etc. It may be fitted in wet and dry areas such as bathrooms and washing rooms. guards are made of uncoated stainless steel. The reflector is made of high-gloss polished aluminium. Energolnfra is available in three models, EIR500,EIR1000 and EIR1500 at 230V, see table. can also be suspended on wires, chains etc. The infra heater is approved in splash-proof IP44 design for wet and dry rooms and for outdoor installations. end of the heater. Connection between several heaters is possible. 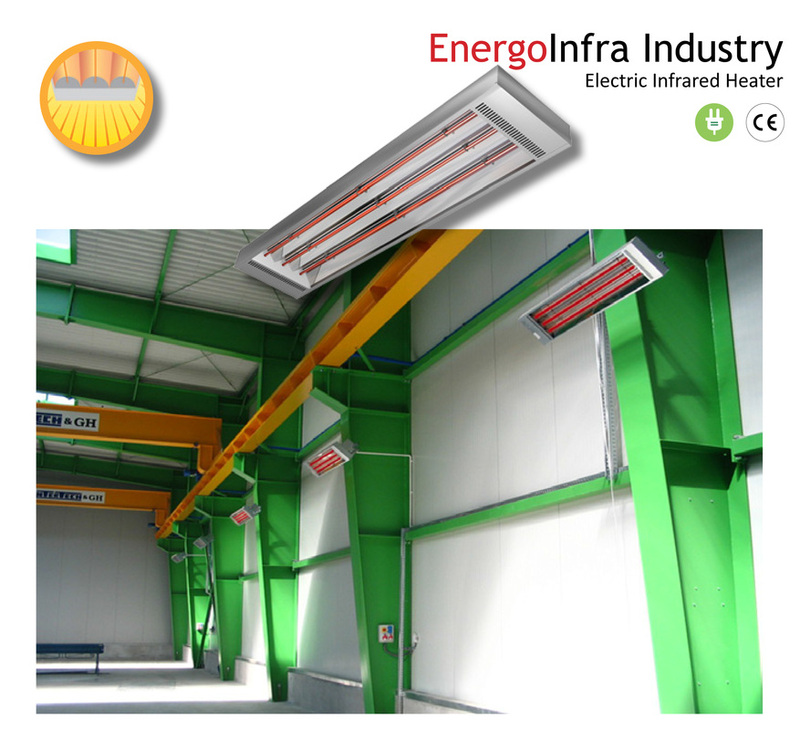 Energolnfra Industry provides an energy efficient heating for most applications and working environments with high ceiling heights, approximately 3-40m. Heat accumulation in floors, walls and other surfaces means that the air temperature can be lowered giving 25-50% energy savings and yet achieving the same warmth comfort. Energolnfra Industry, with its high operating temperature, may also be used outdoors, i.e. loading bays etc. The heater is approved in splash-proof IP44 design for wet and dry areas and out-door installations. Just like the sun warms the earth, EnergoInfra Industry emits high temperature radiation which warms floors, walls and other surfaces. As a result you can lower the air temperature in the room and yet achieve the same warmth comfort with energy savings of 25-50% in comparison to hot air heating. The heater has three separate heating elements, 1+1+1, and can be connected to either 230V or 400V. It can be ceiling or wall mounted. Supplied fixing brackets are adjustable and can be angled in different fixed positions. The heater can also be suspended on wires, chains etc. (optional extra). EnergoCassette can be used in false ceilings or directly onto the ceiling on supplied brackets. The heater is suitable for installation up to approximately 4 m ceiling height. It has a low surface temperature, no greater than 100°C and emits a gentle and comfortable heat. EnergoCassette is approved in spray-safe IP55design for wet, dry and fire hazard areas. Suitable for a wide range of installations from schools to stables. Frees valuable wall and floor surfaces with energy savings of 15-30%. 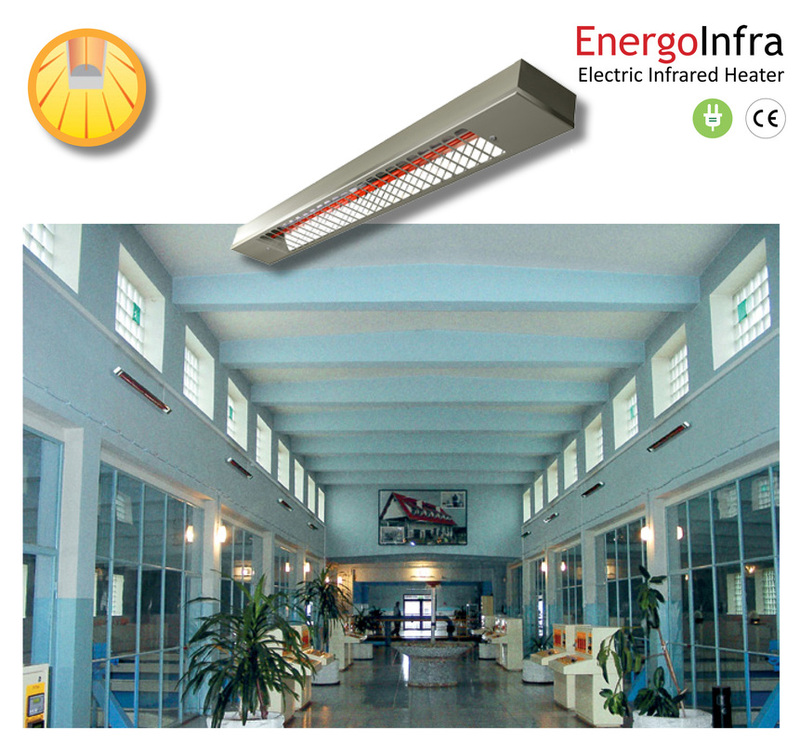 EnergoCassette ceiling heating system is the most natural and comfortable way to heat your premises. EnergoCassette gently radiates, low temperature heat to floors, walls and objects in the room, just as the sun heats the earth. As a result you can lower the air temperature in the room and yet achieve the same warmth comfort with energy savings of 15-30%. 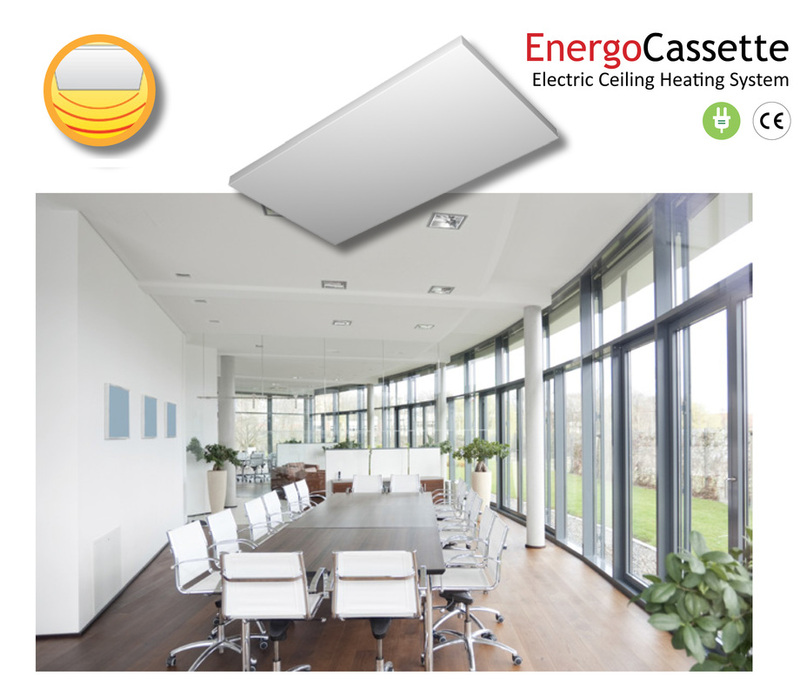 The low surface temperature of the EnergoCassette makes it especially suitable for low ceiling heights and it may be fitted up to approximately 4 m. The stylish and elegant design therefore suits projects like offices, schools, showrooms, hospitals, houses etc. With the approval of spray-safe IP55 design for wet, dry and fire hazard areas, it may be used in shower areas and the agriculture and pulp industries etc. EnergoCassette is an universal model, designed for fitting flush into a false ceiling (T-Bar, 15-24 mm) or fitted directly onto the ceiling on supplied ceiling fixing brackets. As it is ceiling mounted it frees valuable wall and floor space. Furthermore it is safely away from contact and damage which is an advantage for use in public places. EnergoCassette is made of galvanised sheet steel and comes as standard in white powder coated finish, RAL9016. It is available in two sizes and outputs at 230V, see table. EnergoCassette is approved for fixed installation by an authorised electrician. Cable connections are to a 4 mm² terminal in the junction box on top of the heater. Connection between several heaters is possible. 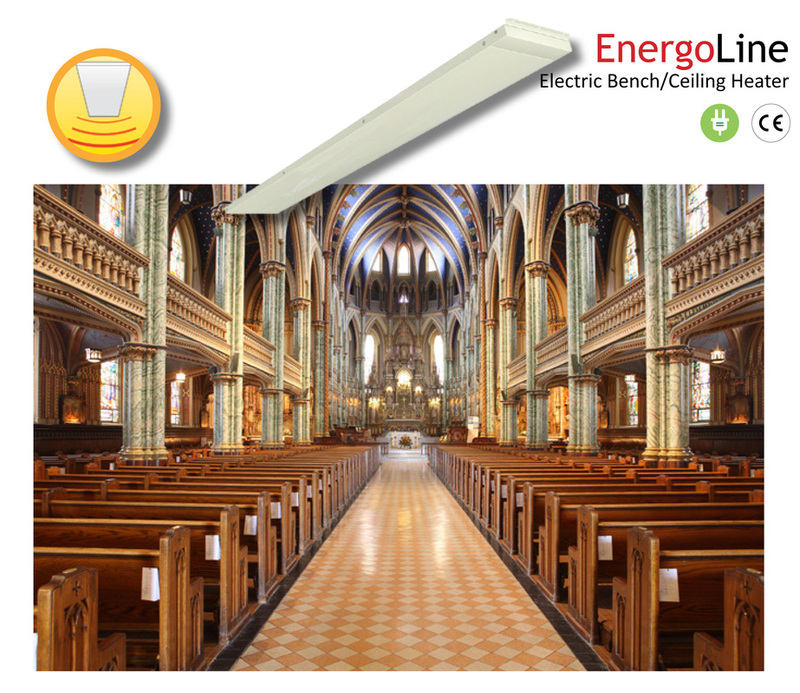 EnergoLine may be fitted underneath benched in churches, waiting rooms, halls, sports halls spectator stands etc. When ceiling mounted it has a range up to 3 metres to the floor. The elegant slimline heater provides a comfortable and gentle heat while being unobtrusive and aesthetically blending into the surroundings. Energoline is approved in splash-proof IP44design for wet and dry areas. EnergoLine is a slimline, 3.5 cm thick, low temperature heating panel which mainly emits radiant heat. 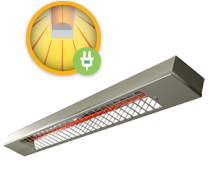 It has been developed especially as a bench heater but can also be fitted as a ceiling heater. As a bench heater it may be fitted underneath benches in churches, waiting rooms, halls, sports/leisure halls etc. It warms the bench as well as the floor directly underneath. This is a particularly good method to warm specific areas where large air volumes are present which does not need to be heated. The bench heater has a rapid heat-up time with comfortable heat directed to where you want it, with good economy and low energy consumption as a result. 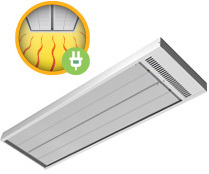 As a ceiling heater it is suited to smaller spaces with low ceiling heights up to 3 m. It can be ceiling or wall mounted. Effectively it replaces heat Iosses and down draught. It achieves high warmth comfort and energy savings of 15-25% in comparison to conventional heating systems. The thin and elegant design blends in well with the environment and when ceiling mounted it frees valuable wall and floor space. Furthermore it is safe from contact and damage which is an advantage in public places. EnergoLine is made of galvanised sheet steel and comes as standard in white powder coated finish. It is available in two sizes and outputs at 230V, see table. EnergoLine is approved in splash-proof IP44 design for wet and dry areas. EnergoLine is approved for fixed installation by an authorised electrician. Cable connections are to a 4 mm² terminal in the junction box on top of the heater. Connection between several heaters is possible. Heat control is carried out simply with the use of our room thermostats. Where a large number of heaters are fitted, one of our automatic control panels may be used.